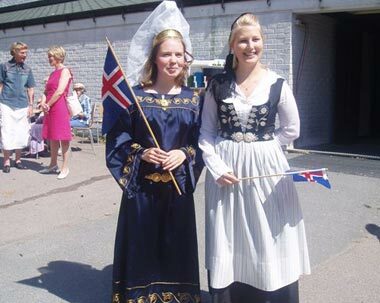 Icelandic national costume has enjoyed various levels of popularity since the term was coined in Iceland in the 19th century, during the fight for independence. Since 2001 the national costume is regulated by The National Costume Authority, which preserves the correct techniques of making them. Five types of costume are all recognized as Icelandic National costumes. Some were designed in the 18th century from scratch as ceremonial costumes, while other is traditional daily wear of Icelandic women in olden days. The men costume exists in three or four radically different versions. The men national costume is the only direct descendant of traditional daily wear of Icelandic men, while the other were designed from the start as ceremonial costume. Guðrún Ingólfsdóttir or Gingó, which is her artist name, is a painter and a ceramic artist. Gingó has learned design course, studied at Reykjavík art academy where she studied ceramic specialization, clay course and also studied painting. Lately she has been designing and working on souvenirs. She uses the nature and surroundings to inspire her. She for example designs and produces sand-candles, the material are all form the county and she has also designed candles that look like the Northern lights, which you can see her in Höfn. Arfleifð specializes in high quality handcrafted clothing and accessories made from materials such as animal and fish leather, horn, wool and horse hair. All of the mat erials are Icelandic and processed using traditional methods. The products are designed from the natural shape of the materials and carefully handcrafted with focus on details and difference which makes each piece absolutely unique. The founder, Ágústa is from Höfn. She is a shoe and an accessory designer. Millibör is run by Ragnheiður who is designer and a tailor. Millibör is specialized in designing and manufacturing beautiful and stylish woman's clothing made of high quality materials. Ragnheiður uses the nature and environment around her as inspiration. Svavar Guðnason was an Icelandic artist who worked for many years in Denmark. He is considered one of the most known artists of Iceland in the late 20th century. His paintings are in many museums in Denmark and also in many private museums in Europe.